a group of stalls often selling the same wares. Hakuna Matata, karibu Afrika - Yet another tourist will be welcomed to this exotic paradise for a get away , but where we will work hard and assist them to have a close-to-home as possible experience. But hey, that was not meant to be the opening sentence for this post. The title of the post comes from the popular Larry Madowo, known for his business reporting especially in shows like PM Live. We were at some of those events that journalists, reporters and bloggers keep attending: - some product launch here , some announcement there. It was at one of those launches that someone was mentioning watching something on Afternoon Live. I asked whether they meant PM Live, I rarely watch TV and had not heard of Aftrenoon Live. Apparently Afternoon Live is a business program aired by the Kenya Broadcasting Corporation (KBC) as a response to NTV's PM Live. That's when I asked if the Kenyan Media would ever stick to originality, rather than copying each other. Larry replied that it was a monkey see, monkey do affair. See, part of the reason Ii do not watch TV is that I have learned to entertain myself. For most of my school life, I could only watch TV over the weekend. Most of the time however, the channel I was watching got boring, boring because probably I was not a fan of soul music, or TV preaching , sport shows and gospel shows. Despite having other stations to choose from, your effort was rewarded by finding a variation of the same show across all other channels. To date, the situation has not changed, all TV stations can publish a generic guide that will apply to all. News at 7 pm, followed by a comedy on some days, a soap on most of the days and again followed by 9 pm news. Weekdays are even better, Morning News show and Newspaper review, followed by several hours of CNN, something live and later on a music show at 5 pm. Saturdays have a music show in the morning while Sundays have preaching and Gospel shows. One would be forgiven to think that the TV stations hold consultative meetings to come up with a schedule. Mind you I have left out Nigerian movies, by the time I gave up on watching TV, they were yet to discover them. As of today, I spend time that I should have spend watching interesting programs listening to radio. While there is some diversity on the radio stations, with the General (Swahili), Top 40 (Kiss, Easy) Classic and Urban , the Urban section is still wanting. I think it's a government requirement that they must hold a countdown every weeknight and play reggea/dance hall on Sunday. Don't get me wrong, I am a fan of dancehall, but I need a little variety. It is for this reason that I will mostly tune in to Tanzania's East Africa radio , who are so unique that they cant decide whether to settle on 94.7 FM or on the noisy 95.4 FM. Given that my Sundays are boring, with radio stations outdoing each other with dancehall and TV stations doing the same with Gospel shows and soaps, I attempt to venture into town in an attempt to avoid death through boredom. This only leads to more anguish. 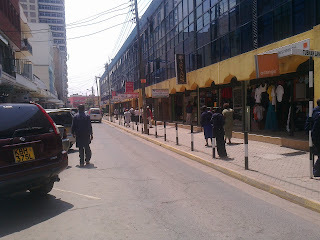 Of late, I have bee trying to postpone a meeting with my maker, mostly by noting badly driven matatus and avoiding them. However, the government once declared that all matatu's be painted white since government officials are blind and it would save the country foreign currency if it imported white car paint in large quantities. Well, the reason was that it would instil some discipline in the matatu industries. The problem now is that I have thousand of white matatu's to identify. In town, the situation is not different. Every other ground floor that is not an Equity Bank branch, a Nakumatt supermarket, a Tuskys Supermarket branch or a 'Chicken and Chip's shop is a stall. Thousands of stalls face the city streets, which themselves are parked with thousands of white Toyota's. The strangest of things however, is not that all stalls along one street will prefer to sell the same line of garments, maybe suits, ladies wear or jeans, but that each stall will sell exactly what the next stall and the one after that is selling . The apparel stocked in most of those stalls, unless second hand , will normally be drawn from select brands. While the brands are usually bad imitations (counterfeits) of other top global brands, I consider the pricing about steep. Still, I am still perplexed as to why they don't pick on a uniform price. Walk around town more, and you will be blessed enough to find another group of stalls that sell ICT equipment, well, the quality must be a little bit wanting. I don't know if it has occurred to Kenyans , that probably, we might have different tastes. That probably not all of us watch soaps, or listen to dancehall and gospel on Sundays. Apparently competition in the country is imitating what the market leaders are doing, rather than creating your own products and services to compete with them . Picture this, a leading local company has launched their own chewing gum brand to compete with PK. The new brand imitates PK in every way possible, short of the name, coming in the same colour and matching package as their competitors. In Africa, its a great forest, with many monkeys, all looking at other monkeys and imitating them. Miss Kerigo : Why so serious?